Editor’s note: Local government debt, in particular the trillions of yuan of liabilities hidden in financing vehicles, is threatening to overwhelm dozens of authorities across the country. In the first of this two-part series, we look at how the eastern city of Zhenjiang is struggling to defuse a looming debt repayment crisis. For Part 2, click here. The Financial Tower in Zhenjiang offers a spectacular 360-degree view across the city and the surrounding countryside that stretches far into the distance. The 24-story office building, completed in 2013 by a local government financing vehicle (LGFV), dominates the skyline of the Dagang Economic Development Zone, one of thousands that mushroomed across China over the past three decades offering a range of preferential policies to attract companies and foster economic growth. Yet the view isn’t the only spectacular thing about the Financial Tower — it’s spectacularly empty and the company that built it carries a spectacular amount of debt. 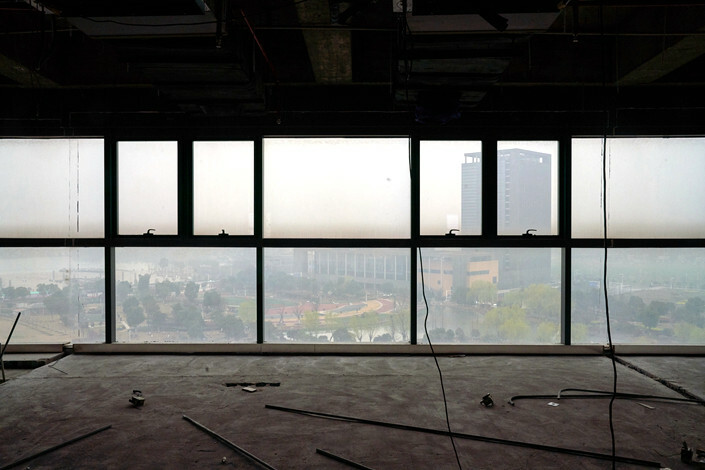 What was meant to be a landmark edifice in an ambitious project by the Zhenjiang government to build a thriving new commercial area, which drew in the old Dagang zone, appears to be deserted. 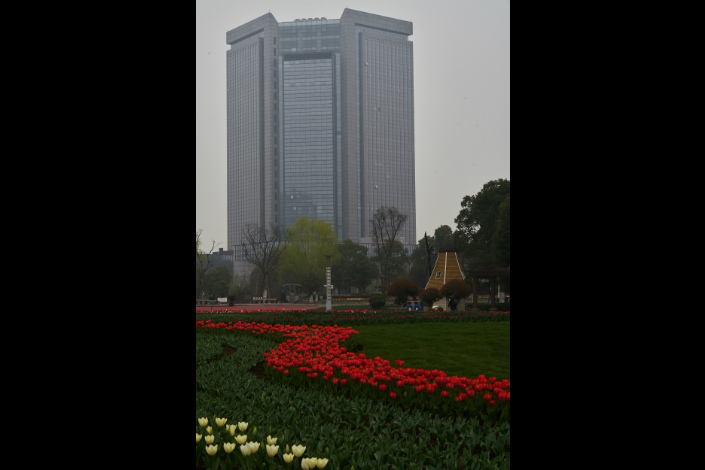 During a visit to the skyscraper on an overcast March afternoon, Caixin reporters found a solitary security guard on duty at the main door. Only one of the tower’s four elevators was operating and it only served floors 1-15. 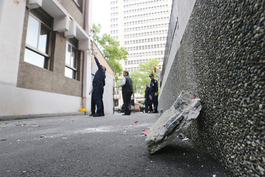 A search of the 15 floors found just one tenant — an investment company that is a wholly owned subsidiary of Jiangsu Hanrui Investment Holding Co. Ltd., the LGFV that built the block. The final cost of the Financial Tower isn’t known, but when construction started, Jiangsu Hanrui said total investment in the project would be 350 million yuan ($52.1 million). The building is just one white elephant project of many that’s landed Zhenjiang, a port city of 3.2 million people in the eastern province of Jiangsu, in a deep financial hole that it’s struggling to escape from. Once famed for producing fragrant black vinegar, Zhenjiang is now at the center of a debate and a battle within government, policymaking and financial regulatory circles about how to clean up trillions of yuan of hidden local government debt accumulated by thousands of LGFVs, special purpose vehicles set up by local authorities to borrow money to fund infrastructure and public welfare spending. Zhenjiang, which has the biggest debt-to-fiscal-revenue ratio of any city in the province, is being seen as a testbed for government policy to allow local authorities to extricate themselves from a debt crisis that’s built up over the past decade and which policymakers, as far back as 2014, pledged to tackle but have so far failed to come to grips with. Figures from the Ministry of Finance (MOF) show that official on-budget borrowing, known as explicit debt, of all local governments combined amounted to nearly 18.4 trillion yuan (link in Chinese) at the end of last year. But an official with one of the country’s financial regulatory bodies told Caixin that the unofficial, off-the-books liabilities of most provinces, known as implicit debt, could be around 2.5 times bigger. Added together, the total debt of local governments would amount to more than 70% of the country’s gross domestic product (GDP) in 2018. A huge chunk of that hidden debt lies with LGFVs, whose interest-bearing liabilities at the end of 2018 amounted to more than 30 trillion yuan, some 34% of GDP, according to a March report by Beijing-based investment bank CICC. More worrying, its analysts said, is that overall, LGFVs are unable to repay their maturing debts and interest coming due within one year from their operating cash flow, making their survival dependent on their ability to refinance what they have borrowed. Zhenjiang’s borrowings are exploding, partly due to a massive urban construction investment program that took place during 2012-2017 that the city government said (link in Chinese) amounted to 290 billion yuan. Its explicit debt, made up of general and special purpose bonds (SPB), had already risen to 23.7 billion yuan (link in Chinese) at the end of 2017, just below a MOF-mandated ceiling of 25 billion. Although SPB were only introduced in 2015, at the end of 2017 Zhenjiang had already issued 16.1 billion yuan of the instruments, which are supposed to be repaid with returns from the specific projects they invest in rather than fiscal revenue. 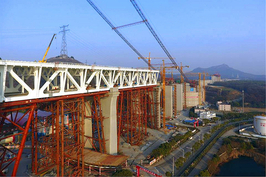 By the end of 2018, the total had surged to 30.1 billion yuan as the central government encouraged local SPB sales to fund infrastructure investment to prop up economic growth. This year, the city is seeking a quota of 36.6 billion yuan, more than 2.5 times the 14 billion yuan it issued in 2018. On top of that, Zhenjiang has racked up hundreds of billions of yuan of hidden debt. Although there’s no official data, a report in August 2018 by Guosheng Securities estimated the city had accumulated interest-bearing liabilities of 393.4 billion yuan at the end of 2017 through its LGFVs. Guosheng analysts say a 2018 estimate is not available because the LGFVs have yet to release their latest annual reports. Zhenjiang has 18 LGFVs according to Wind, a financial data provider. The five biggest include Jiangsu Hanrui, Zhenjiang City Construction Industry Group Co. Ltd and Zhenjiang Transportation Industry Group. The combined debt of all 18 LGFVs was almost 14 times the city’s general fiscal revenue of 28.4 billion yuan in 2017, the highest ratio among all cities in Jiangsu, which itself is one of the most debt-laden provinces in China, Guosheng analysts estimate. “We often joke that every slab of pavement in Zhenjiang was laid with money borrowed from financial institutions,” an executive with the risk control department of a local bank, who declined to be named, told Caixin. Zhenjiang, like many local authorities, managed to kick its debt can down the road for several years through various means including refinancing the borrowings of LGFVs as government policy on dealing with the liabilities became more accommodating in 2015. But 2019 could be the year of reckoning as maturing liabilities reach a peak and the city government’s coffers weaken amid slowing economic growth. GDP rose by just 3% in 2018, according to government data, less than half the 7.2% pace in 2017. At the same time, fiscal revenue has stagnated. 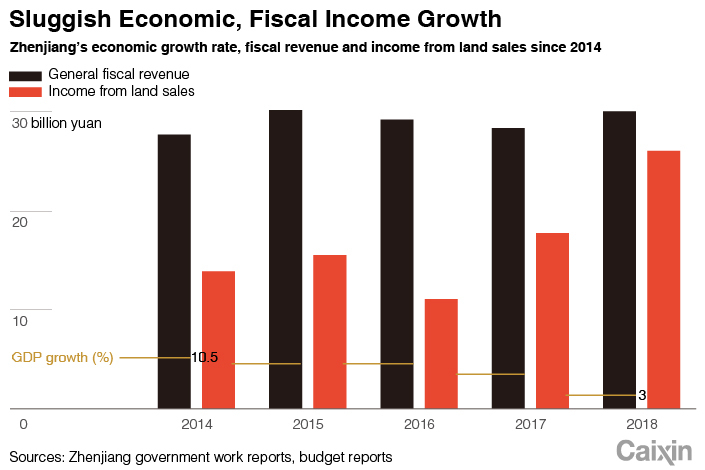 Central government-mandated cuts in taxes and fees are adding to the city’s pain, and the squeeze is being compounded by a slump in revenue from land sales. A total of 50.4 billion yuan in principal and interest on bonds issued by Zhenjiang’s LGFVs is due this year, an almost 60% jump from 2017, Guosheng Securities wrote in another report in November 2018. That is 1.28 times the amount of funds the city had last year for debt repayment, the biggest gap among the nearly 90 cities that the broker surveyed. A look at the prospectuses of some of the LGFVs issuing bonds show how precarious their finances are. Jiangsu Hanrui, for example, which is 100% owned by the Zhenjiang government, has debts of around 50 billion yuan. 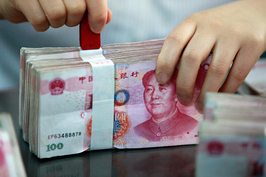 It raised 300 million yuan in March through the sale of 270-day super short-term commercial paper (SCP) to pay back most of a 400-million-yuan SCP maturing in May. The company reported net income in the first nine months of 2018 of just 242.4 million yuan and said its ability to earn a profit was “weak,” noting that more than half its cash flow came from payments from the local government budget. It also warned investors that Zhenjiang was drafting a plan to tackle its debt that could strip the company of its function of continuing to raise funds for the local government. If such a measure was implemented, it said, its ability to repay the SCP could be at risk. The company, which claims to be the “most important developer and constructor” in Zhenjiang’s New Area, also warned that its profitability would be negatively affected by the economic problems currently being experienced by the Zhenjiang New Area and by weakening demand for land and commercial property. The firm also has offshore debt — one of its units, Jiangsu Hanrui Overseas Investment, has a $300 million three-year bond maturing in June and a $100 million bond due for repayment in December 2020, according to Moody’s Investors Service. 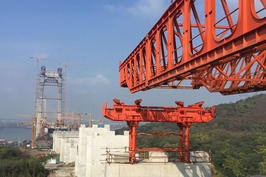 Zhenjiang City Construction Industry Group raised 500 million yuan in February through the sale of 270-day SCP to repay debts due that month. The company said its interest-bearing liabilities totaled 81.9 billion yuan by March 2018, up 7% from the end of 2017. Zhenjiang Transportation Industry Group, whose ratings were cut by S&P in September 2018, reported total outstanding debt, including bonds, of 33.6 billion yuan at the end of September, up from 30.8 billion yuan at the end of 2016. The scale of the liabilities racked up by Zhenjiang’s LGFVs has prompted the Ministry of Finance and financial regulators to intervene to come up with a plan to defuse the risks and help the city work through its debt problem, an issue addressed in more detail in Part 2 of this in-depth report. But in the meantime, the LGFVs are still having to honor their debt obligations, and the city and provincial governments are working hard to ensure there are no defaults. In December 2018, Jiangsu province’s regulators convened a meeting with securities firms to discuss Zhenjiang’s predicament, sending a clear message that with 2019 a peak year for repayment of urban investment bonds, they would be required to cooperate to ensure zero defaults, an analyst in the fixed-income department of a brokerage told Caixin. Although local governments have been told not to bail out financing vehicles, they are still working behind the scenes to ensure that companies — both LGFVs and state-owned enterprises (SOEs) — repay their debts. But debt rollovers and emergency bailouts are not long-term answers to the problem of hidden debt. In Part 2 of our report, we look at how some local governments have been trying to come up with their own solutions, and the disagreements between the Ministry of Finance and financial regulators over how to tackle the problem. To learn more about how the city of Zhenjiang became the poster child for China’s local government debt crisis, check out Part 2 of the story.